Macbeth, with many parts shown. Top left: Banquo and Macbeth meet the witches. Middle-left: Macbeth has just killed Duncan, and talks with his wife. Bottom-left: Banquo's ghost. Bottom-right: Macduff duels Macbeth. Macbeth is a play by William Shakespeare. Shakespeare wrote three types of plays; histories, comedies and tragedies, and Macbeth is the shortest tragedy written by Shakespeare. It was written between 1603 and 1607, during the reign of King James I of England. Shakespeare based some characters in the play (Macbeth, Macduff, and Duncan) roughly on records of real people in Holinshed's Chronicles, a history book from 1587. However, the things that happen in the play are very different from what happened in real life. 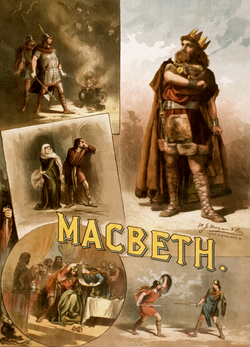 Macbeth is one of Shakespeare's most popular plays, and has often been acted since his time in theatres and movies. There have been several comic books and novels written based on the story of the play too. The first characters we see in the play are the three Witches. They talk to each other in a mysterious way, and agree to meet with Macbeth on the heath. This scene includes the famous line "fair is foul, and foul is fair", a subject which becomes a main part of the play. In Act 1 Scene 2, there is a war going on. King Duncan is at a camp, listening to reports from the battlefield. An injured officer (some scripts say a captain, others a sergeant) is brought in. He saved Malcolm's life. The officer tells Duncan about the battle. He says that it was going badly, until Macbeth fought his way to the rebel leader Macdonald and disembowelled him. But as soon as that happened, the Norwegians, led by their king Sweno, also attacked. They were joined by a traitor, the Thane of Cawdor. Macbeth and Banquo fought bravely until they were defeated. Duncan is pleased by the news. He orders that the Thane of Cawdor be executed and his title given to Macbeth. In I.iii, the Witches appear again. They talk about using their powers on humans, and it becomes clear that they have a lot of power, but they cannot kill people. Macbeth and Banquo are returning from the battlefield to Forres, and meet the witches. Banquo is amazed by the way the witches look, because they look like women but they have beards. Macbeth is not afraid and asks them what they are. They do not answer him, but greet him as the Thane of Glamis, the Thane of Cawdor and the future King. Macbeth is surprised, because he knows that he is not the Thane of Cawdor, and does not think he will ever become the King. Banquo asks the witches what his future will be like. They answer in riddles, saying that he will be "lesser than Macbeth, and greater", "not so happy, yet much happier", and that he will be the father to a line of kings. Then the witches disappear. Ross and Angus come to find Macbeth, and tell him that the King has given him the title of Thane of Cawdor. Macbeth is surprised and happy, but he starts thinking of ways to become king. This frightens him, because he thinks that the only way he can become king is to murder Duncan. In I.iv, Macbeth and Banquo return to Forres and Duncan thanks them for their courage and hard work. He also says that his son Malcolm will be his heir. Macbeth realizes that he will have to get past both Duncan and Malcolm to become king. Duncan says he is going to Macbeth's castle for the night. In I.v, Lady Macbeth is reading a letter from Macbeth that tells her about the witches and their prophecy. She is very excited, and starts planning to murder Duncan. A messenger tells her that Duncan will be staying at their castle that night. She calls on evil spirits to make her strong and evil so that she can murder Duncan. Macbeth comes in and she tells him of her plans. I.vi shows Duncan, Banquo, Donalbain, Malcolm, Macduff and some of the thanes entering Macbeth's castle. Duncan and Banquo agree that the castle is sweet and pleasant. Lady Macbeth enters and greets them. I.vii is the last scene in Act I. Macbeth is talking to himself about why it is wrong to kill the king. He knows that it is a bad thing to do, especially because he is the host and Duncan trusts him. Lady Macbeth enters and scolds him for being a coward and says that he is not brave enough to be a man. She works out how they are going to kill Duncan, and convinces Macbeth to do it. Act II starts with Banquo and his son Fleance walking in a courtyard in Macbeth's castle. They meet Macbeth, who lies to Banquo and says that he has not thought about the witches' prophecy. When they leave, Macbeth sees a hallucination of a knife. He knows it is not real, but before his sight it changes and becomes covered in blood. He leaves to kill Duncan. Lady Macbeth enters in scene ii. She has already made Duncan's guards drunk. Macbeth comes in with his hands covered in blood, carrying the knifes of the guards. He is very troubled. Lady Macbeth comforts him and tells him to wash his hands and cover the guards with blood, so it looks like they did it. But Macbeth is afraid, so Lady Macbeth does it instead. In II.iii, the porter is very drunk. He pretends to be the porter of the gate of hell, and takes a long time to open the gate for Macduff and Lennox. Macbeth greets them. Macduff says that he is there to wake the king, and Macbeth leads him to the king's room. Macduff is shocked to see the king murdered on his bed. He runs out shouting and wakes everybody up. Macbeth pretends he did not know about the murder, as everyone comes to see what is happening. He admits that he killed the guards, and says that he did it because he was so angry that they killed Duncan. Lady Macbeth faints and they rush to help her. Malcolm and Donalbain think that somebody is lying. They know it is not safe for them to stay in Scotland, so they run away. Malcolm goes to England, and Donalbain to Ireland. Scene iv is a talk between Ross and an old man. They talk about how strange the night was. Nature seems to have turned into a mess now that Duncan is dead. Macduff comes in and says that Macbeth is going to become king. He does not trust Macbeth, and is not going to the coronation. Banquo is alone on stage at the start of Act III. He realizes that Macbeth has become everything the witches said he would become. He thinks that Macbeth did wrong to get the crown, but he does not want to say anything. He hopes that his son will also be king, as the witches said. Macbeth, Lady Macbeth, and the lords enter. Macbeth asks Banquo if he is going riding that afternoon, and if Fleance is going with him. Banquo says yes to both. Two men come to see Macbeth, and he goes to meet them. He is angry that he has risked everything to become king, but that Banquo's sons will be kings after him. The men are actually muderers. Macbeth tells them that Banquo is the reason they are unhappy and have bad lives, and orders them to kill Banquo and Fleance. Macbeth talks to Lady Macbeth in scene ii. He says that he has nightmares and cannot sleep. He is jealous of Duncan, because he is dead and does not need to worry anymore. Macbeth also says that he is worried about Banquo being alive, but he does not tell his wife about the murderers. In III, the two murderers meet another one, also sent by Macbeth. They kill Banquo, but Fleance escapes. In Scene iv Macbeth has a banquet with the nobles. The murderers come in and inform him of Banquo's death and Fleance's escape. He returns to the table where the nobles are eating, and looks for a seat. Even though there is one empty, he cannot see it. He has a vision of the murdered Banquo sitting in his seat, and becomes hysterical talking to the vision. Lady Macbeth explains it to the nobles as an illness, and asks them to leave as Macbeth becomes more and more upset. Many editors say that scene v of Act III, along with a song in IV.i, is not written by Shakespeare. This is because the writing is different to the way Shakespeare usually writes. It has a witch called Hecate in it, who is not previously mentioned in the play. She seems to be in charge of the other witches and is scolding them for dealing with Macbeth without informing her. In the final scene, Lennox is talking to another lord. They find out that Macduff has gone to England to convince Malcolm to return and claim his throne, and to ask for the help of King Edward of England. Scene (i) starts with the witches, who are standing in a circle around their cauldron, throwing things in, like the tongue of a dog. Then suddenly Macbeth arrives and asks them to tell him some more prophecies. As the first prophecy they tell him to be careful of Macduff, Thane of Fife. As the second prophecy they say he can't be killed by anyone who was born of a woman and as the third prophecy the witches say if Birnom Wood stays at its current position Macbeth is okay but if the wood moves he will have problems. Macbeth is happy because he thinks that all of these things are impossible. He wants to know a fourth thing but suddenly the witches dance crazily and then run away. Next Lennox enters and tells Macbeth that Macduff has fled to England. Macbeth orders Macduff's castle to be seized. In scene ii Macbeth’s men arrive at Macduff’s castle and kill Macduff´s family and everybody else in the castle. In scene iii Macduff finds out what Macbeth did to his family. He is very sad and angry, so he decides to go back to Scotland with Malcolm and they plan to kill Macbeth. Scene i takes place in Macbeth’s castle. A doctor and a servant are talking about Lady Macbeth. They’re talking about Lady Macbeth’s sickness. She is sleepwalking and while she sleepwalks she says that she regrets having told her husband to kill Duncan and Banquo. In scene ii Lennox and other Scottish thanes think that Macbeth is crazy and that he is killing too many people. Together they go to Malcolm and king Edward of England and tell them that they want to fight against Macbeth with the English army. Scene iii takes place in Macbeth’s castle. He is told that Malcolm and Macduff are coming with the English army and want to kill him. The doctor tells him that his wife is ill. She has become crazy and is sleepwalking. In scene iv Malcolm, Macduff and the English army hide in Birnam Wood. They don’t want to be seen, so they cut off some branches and cover themselves with them. In scene V, the doctor comes to Macbeth and tells him that his wife is dead. Macbeth is depressed, and then he has a monologue about how meaningless life is. After that, a servant says that Birnam Wood is moving, but Macbeth doesn't believe him, so the servant shows him. In scene VI, Macduff, Malcolm and the English army are planning to attack Macbeth. In scene VII, Macbeth and an English Lord fight, and Macbeth says he cannot be killed by anyone born of a woman. Macbeth then kills him. Meanwhile Macduff is looking for Macbeth. Scene VIII shows the fight between Macduff and Macbeth, who says again that he cannot be killed by anyone born of a woman. Macduff replies that he was cut out of his mother‘s stomach (Caesarean). He then kills Macbeth. In the last scene Malcolm is declared king. Many actors think it is bad luck to say the word "Macbeth", and will not say the play's name. Instead, they call it "The Scottish Play". One theory about where this superstition came from is that the play deals with witchcraft. ↑ "Macbeth: Summary & Analysis Act III Scene 5". CliffsNotes. 2014. Retrieved 16 January 2014. ↑ "Home Page – The TLS". TheTLS.